I usually stay away from the mainstream tourist attractions, but Caminito, in the Buenos Aires neighborhood of La Boca, is a photo op that I couldn’t miss. 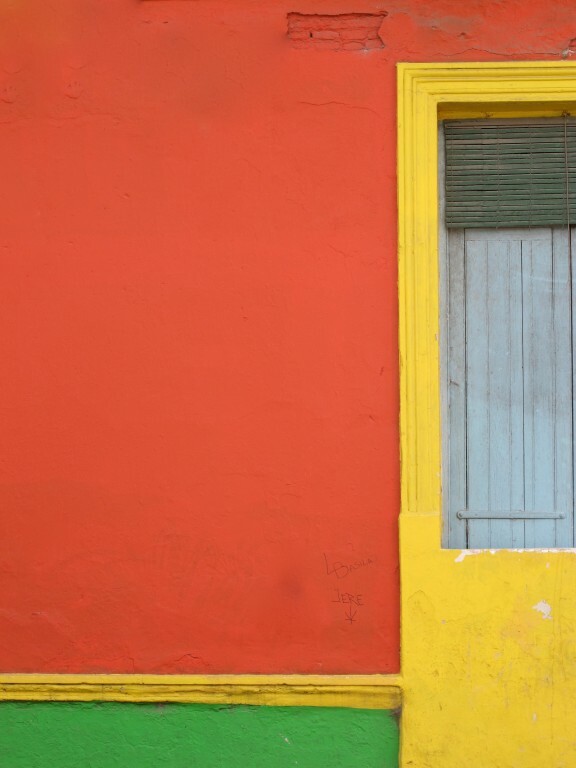 Besides being an irresistible location to take photographs, La Boca actually has a compelling story. Between 1880 and 1930. millions of immigrants showed up in Argentina, about half of them Italian. A lot of the Italians came from the port city of Genoa, so it made sense that they settled in La Boca, the port of Buenos Aires. Paintings and reliefs on the buildings illustrate scenes from the history of Caminito. The immigrants not only built their houses almost completely from materials found or discarded in the shipyard, the paint they used on the exterior was also leftover from the port, which made for some pretty garish color combinations. Mind you, these are not the original houses of the early 20th century. In the early 1950’s, the train to La Boca stopped running, and the colorful houses of Caminito were torn down and the area fell into disrepair, eventually becoming a landfill. Not pretty. There are tributes to him everywhere, immortalized in a 1980 mosaic, a crudely sculptured bust on a post in the street, and on the side of a restaurant. With his efforts, Martin created the world’s first outdoor pedestrian museum. On this quiet winter morning, I pretty much had the place to myself, besides the locals. This guy was selling churros and coffee from his bike. Always wanting to push the boundaries (literally), I wandered beyond the little street of Caminito into neighboring parts of La Boca. It got a little shabby beyond the main drag. The dogs walked away, and I heeded her advice and hightailed it back to Caminito, where restaurants were opening their doors and preparing for the day. Artists were beginning to set up their work. Paintings of tango dancers, aimed at tourists, were plentiful, but this artist seemed to have avoided that trap. I liked his style so much, I bought one of his paintings. The little street was starting to fill up, so it was about time for me to head out . . . I stood at the port, where the immigrants had first arrived here. Then, with the technicolor world of Caminito stored in my camera, I was off to my next adventure.